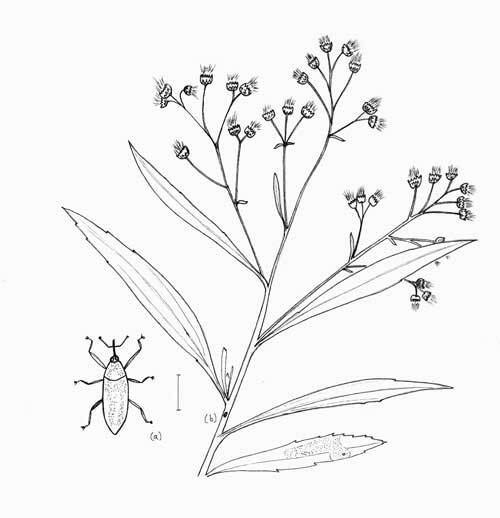 Many insect species are associated with this plant. The curculio at lower left excavates a small hole in the stem into which it deposits eggs. The resulting larvae (grubs) bore through the stem. The leaf at lower right has been fed upon be a leaf mining moth. The flattened larvae tunnel between the top and bottom cortex of the leaf leaving a partially translucent and brownish splotch. A small hole represent the emergence pathway used by the mature insect. SHRUB: Evergreen shrub 2 to 5 m tall; leafy. May die back to ground level after severe frost. FLOWERS: Conspicuous clusters of small white flowers at apex of plant. Appear mostly in mid to late summer, but also occasionally throughout the year. LEAVES: Shiny, dark green, leaves are shaped like those of willows, thus another common name Seep-Willow. FRUIT: Female shrubs bear an abundance of comose seeds that are wind dispersed. RANGE: Common from 250 m up to 1500 m along riparian streams and around seeps in the Upper Sonoran of Arizona and Sonora. By August and September these plants offer a veritable banquet of nectar and pollen to a suite of insects, especially bees, wasps, flies, and butterflies. Many predaceous insects and spiders thus find the pickings good within the inflorescences.